In Chinese, sometimes we describe a dish as sha fan. 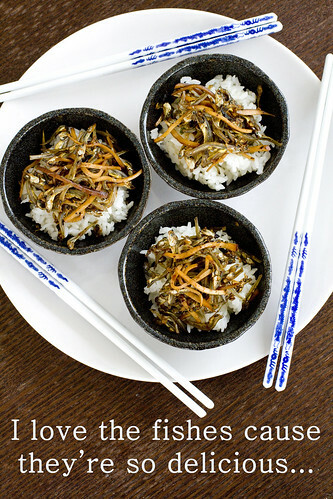 The literal translation is down rice, and what we mean is that it goes down well with rice. It pairs so well with rice that it encourages the eating of more rice. These are usually addictive, salty or spicy foods, and the Dried Sardines with Bean Curd is both. I think of this dish as a confetti of aromatics: fish, ginger, garlic, scallion, and fermented black beans. Just sprinkle a little on rice and it goes a long long way.